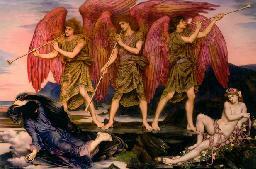 Evelyn de Morgan was the daughter of Percival Pickering, the Recorder of Pontefract. Her mother Anna Maria Wilhelmina Spencer-Stanhope was a suster of the painter John Roddam Spencer-Stanhope. She entered the Slade School of Art in 1873, where she was a very promising student. She sold her first painting in 1875, "Tobias and the Angel". She frequently visited her uncle the painter in Florence. She attracted attention with her painting "Ariadne in Naxos" (1877, De Morgan Centre, London) when it was shown at the first exhibition of the Grosvenor Gallery. She painted in a symbolist style, using themes from classical mythology. In 1887 she married the ceramicist William de Morgan, who was more than sixteen years her senior and with whom she lived in London. Between 1890 and 1914 they spent the winters in Florence. Her husband died in 1917 and Evelyn in 1919. They were buried at Brookwood Cemetery in Woking. 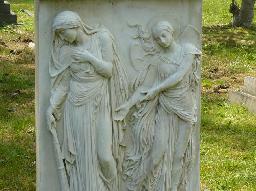 Her grave monument was designed by herself and executed by George Frampton. Many of her works can be found at the De Morgan Centre in London. Work: "Helen of Troy" (1898, De Morgan Centre, London). 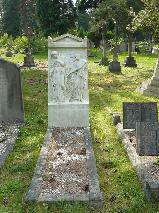 The grave of Evelyn and William de Morgan at Brookwood Cemetery, Woking.